Although many people use the words bruise and ecchymosis simultaneously to mean the same thing, there are considerable differences between them. In most cases, this condition entails the loss of blood at a profound skin tissue level. 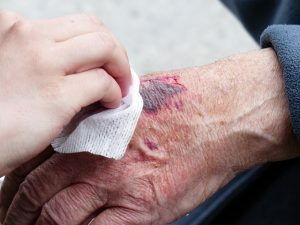 When a small amount of blood seeps out into the tissue beneath the skin, mostly due to trauma, bruises may start to form. Ecchymosis bruises usually change color with time from red to purple to yellow, and finally brown. The color changes may often occur over a period of one to four weeks before disappearing. However, some faded discoloration may persist for several months for people with extreme bruising. Going through the right first aid procedure after an injury is your best shot in reducing purple bruising because it helps expedite the healing process. Bruising and Ecchymosis are the result of blood seeping out into the inner layers of skin due to damage to blood vessels on underlying layers of the skin. However, the difference between normal bruising and ecchymosis does not only lie in the appearance of the skin after the injuries, but also in the areas where they occurred. Normal bruising occurs on any area of the body including around the mucous membrane and in various body organs. However, this condition occurs in mucous membranes and in the lean layers of the skin. (3) While ecchymosis possesses a single flat character, normal bruising has a three dimensional character. Ecchymosis is often considered harmless by many people because it is not a disorder or a condition. However, it may be a symptom of various underlying health complications that may require urgent medical attention. Skin spots may be a sign of an inflammatory reaction or a more complicated medical condition. However, the blood leaking in the inner layers of the skin does not flow out of the skin because the outermost layer of the skin is still intact. Accumulation of blood within the skin layers causes the purplish or reddish discoloration. Ecchymosis may also be caused by underlying medical conditions that cause skin capillaries to rupture. Leukemia refers to the abnormal growth of the tissues that produce blood as well as the production of blood cells. Symptoms of leukemia include excessive bleeding when cut or injured and easy bruising, which are similar to symptoms of ecchymosis. The development of skin spots is influenced by a raise in white blood cells levels. Acute renal failure is the speedy loss of the kidney’s function. When the kidney fails to perform its work of eliminating wastes from the body, harmful chemicals or agents start to accumulate in the body. Ecchymosis could be caused by the waste buildup caused by the acute renal failure. This is cancer that affects the plasma cells in the body. Myeloma is a type of white blood cells that are usually found in the bone marrow. Abnormal growth of the plasma cells in the bone marrow may cause Ecchymosis. This disease is often characterized by the abnormal structure and function of the liver. Ecchymosis could be one of the health complications caused by liver cirrhosis. This refers to the development of an abnormal growth in bone marrow tissues. Fibrosis formation leads to interference in the normal production of the body’s blood cells. 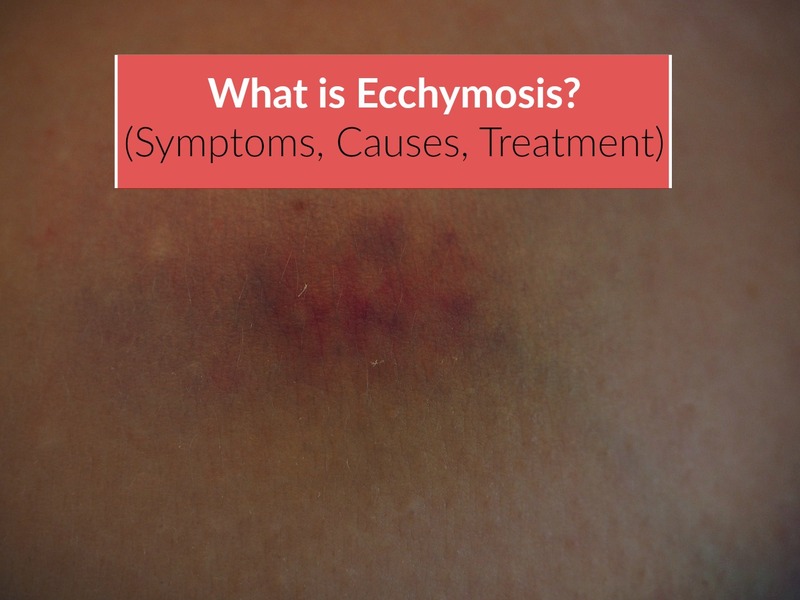 Mild cases of Ecchymosis usually heal on their own without the need for treatment. However, regular occurrence of red spots on the skin accompanied with pain could be a sign of a more serious health condition. Therefore, consider seeing a doctor if this is the case. » Painkillers such as ibuprofen and other types of analgesics can be used to ease the pain caused by Ecchymosis. Add more vitamin C foods to your diet to help promote tissue regeneration. The human body does not naturally produce this antioxidant, which is associated with repairing tissues and helping wounds to heal faster. Adding vitamin C rich foods to your diet can help expedite the healing process for Ecchymosis. The recommended vitamin C intake is 90 milligrams per day for men and 75 milligrams per day for women. Examples of foods rich in vitamin C include unsweetened vitamin C-fortified drinks, low sodium tomato juice, spinach, green or red pepper, fresh pineapples, watermelons, and cantaloupe. Another important nutrient that can help treat Ecchymosis is Vitamin K. Lack of this important vitamin can reduce the blood’s ability to clot quickly after experiencing a cut or a bruise. Vitamin K can help promote normal blood clotting, which can help treat Ecchymosis. The recommended daily intake of vitamin K is 90 to 120 micrograms for adults. Examples of foods rich in vitamin K include leafy Swiss chard, spinach, kale, broccoli, pasta, olive oil, and canola oil. Folate is a type of vitamin B that helps to promote quick healing of bruises including Ecchymosis. Folates such as folic acid are often recommended for patients with Ecchymosis to help promote quick recovery. This nutrient plays an important role in cell division and tissue regeneration. The recommended daily dosage for folates is 400 grams for adults and less than 400 grams for minors. Pregnant women, people with malabsorption disorders, and alcoholics are some of the people at risk of folate deficiency. Consider adding nuts, fruits, legumes, and folic acid fortified foods to your diet. A diet with foods rich in vitamin B can help heal bruises and Ecchymosis faster. 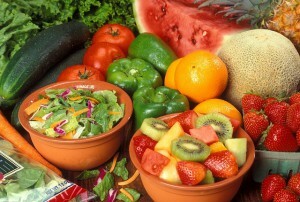 Vitamin-B foods promote the production of blood platelets, which play an important role in clotting. Lack of vitamin B is a common symptom of vegetarians, the elderly, and people suffering from anemia and gastrointestinal diseases. The recommended intake for this nutrient is 2.4 micrograms for grownups. Examples of foods rich in vitamin B include eggs, chicken, low fat milk, fortified cereals, and fish. Ecchymosis is a treatable condition that affects people from different age groups, lifestyles, and cultures. However, athletes and people with underlying health complications such as anemia are most at risk of having red spots on the skin. Consider seeing your doctor to help you determine the cause and treatment options for this condition.